Once upon a time, there was a very naughty goat called Ginger. She used to wriggle out through the gate and wander around the barn when the humans were not around. 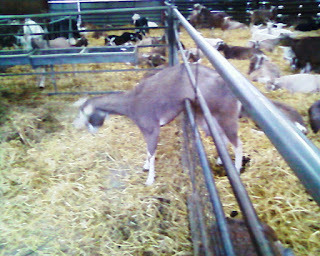 But then she became pregnant and was far too fat to fit through the gate and so, for several months, she had to stay in with all the other goats. And as the weather was so nice last week, we decided to put Valerie and her little men in with the main group of milkers so that they could all go outside and enjoy the sunshine. 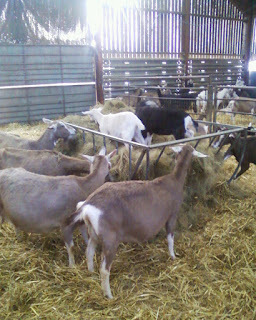 As you know, they have been 'free range' in the barn for a couple of months now but were not able to get out into the field. The black one is much more adventurous and is often found wandering about outside on his own. His little white brother is much more of a mummy's boy - always to be found right next to Valerie! Balham market was great on Saturday and I had a nice visit from GeeGee Parrot's mama, Sal. She brought a HUGE bag of rosemary clippings for the goatie girls,which they all enjoyed in their hayracks yesterday evening. Wonderful Sal has offered to come and sort my garden/jungle out as well. So GeeGee will get to meet the goats after all! I had our yummy goat curd on sale on Saturday and decided to offer something a little different by wrapping it in wild garlic leaves. 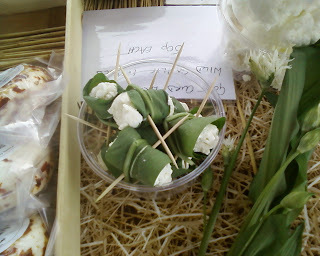 I was lucky to find the most delicious fresh leaves on the Brambletye Fruit Farm stall .... Very popular they turned out to be too! Oh goodness ME.. that very norty Goaty girl called Ginger sounds as if she and old Beaky might be related! Yes, SHE aka My mum is a'rarin to start doing YOUR garden, SHE has potted up all sorts of delicious things, WE do hope YOU like Beans and Peas? They are in little coir pots and are encased in the cleverest propagators YOU will have ever seen.. SHE thinks they may be ready to bring to wobbly Wimbledon' FM weekend after next. Hope that those Currant bushes have their toes in some water??? Yes indeedy .. all snuggly in a bucket with water lapping at their toes.